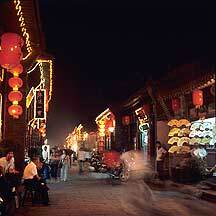 平遥县Pingyao county is located near the center of 山西省Shanxi province, about 100km from 太原Taiyuan, the provincial capital. This historically cultural town had an early existence, since the time of 宣王King Xuan (827 - 782) of 西周Western Zhou dynasty, about 2700 years ago. During the 春秋时代Spring and Autumn Era, it was part of the 晋国Jin state, then later absorbed by the 赵国Zhao state, one of the final seven conquering states of the 战国时代Warring States Era (475 - 221). 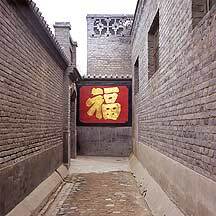 With the establishment of the First Empire, the 秦朝Qin dynasty (221 - 206), a policy of 「郡县制」"System of commmanderies and counties" to divide the empire into prefectures and counties was put into action; Pingyao was then designated as a county, called 平陶Pingtao. By the 汉朝Han dynasty (206 BCE - 220 AD) it was renamed to中都Zhongdu. Its present name appeared during the 北魏Northern Wei dynasty (424). 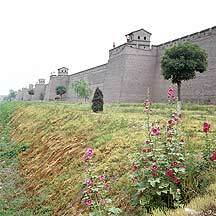 Its famous city wall was built during the 明朝Ming dynasty (1368-1644) in the third year of 洪武Hongwu (1370). 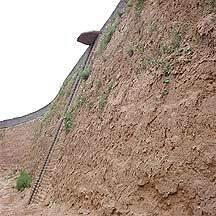 The 12 meters high walls has a perimeter of about 6km, with 4 corner towers, 3000 battlements and 72 enemy towers - numbers that are said to follow Confucius' 3000 students and 72 disciples. Entrance to the town are through six barbican gates - one each on the north and south side and two each on the east and west side. 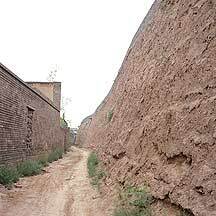 The 12 meters high walls has a perimeter of about 6km, with 4 corner towers, 3000 battlements and 72 enemy towers - numbers that are said to follow Confucius' 3000 students and 72 disciples. Entrance to the town are through six barbican gates - one each on the north and south side and two each on the east and west side. 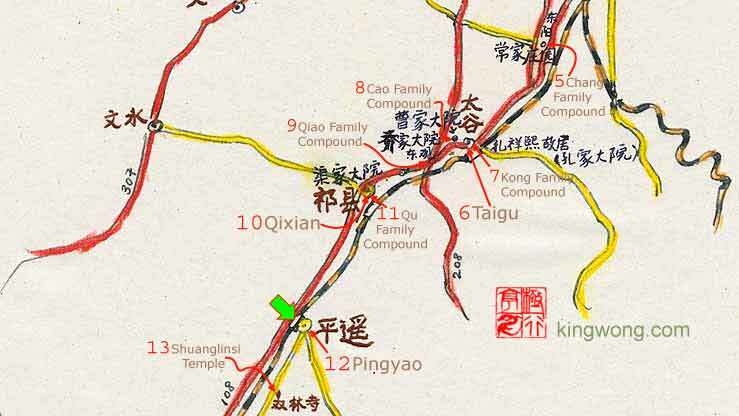 The interior town layout is the classic rectangular grid pattern with the drum tower in its center intersected by four wide east-west and north-south roads; eight minor roads intersects these four and 72 lanes fill in the gaps. Taking up the land are about 3797 courtyard-style building; among them are about 400 well-preserved buildings and storefronts, some from the Ming era, but most are from the Qing. Sourrounding this walled town is a moat about 4 meters wide and equally deep. 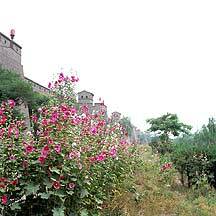 While I was there (2006), the moat was waterless and covered with vegetation. Large areas of the walkway around the exterior walls are made into parks and lined with trees and flowers. As I walked around the walls, I noticed visible cracks on its brick skin; signs are posted to warn people not stay close to the sides. The interior side of the walls are cushioned with rammed earth, the traditional technique used for wall construction in dry desert-like areas. Repairs and reconstruction was underway on these sections of the wall. Outside the walled town is the much larger outer town where all the common things are: the cars, the hotels, the train and bus stations, the markets, the businesses, the local people at work...etc. One can easily get bored inside the walls where everything seems quite similar. But at night it is much more exciting with all the lights glow, and everything gets quiet except the sweet sounds of people returning home on their bikes. 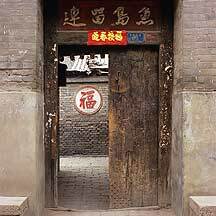 These historical structures aside, Pingyao's real importance lied in its position as the hub of China's first 「票号」"Piaohao", banking institutions. In the late Qing (1800's), this county was the headquarters of more than 50% of the nation's banks, comprising 22 in total. Its influence and stretch was enough that branches were set up in Japan, Singapore and Russia. The first and most influential was the 「日升昌」"Rishengchang". It is still in its original location and you can visit it along with dozens of other locations within the massive walls. 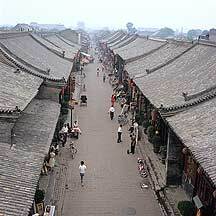 平遥Pingyao is in 山西省Shanxi Province and 太原Taiyuan is the provincial capital. From Taiyuan's 建南汽车站Jiannan Bus Station (South Bus Station), take the bus to Pingyao (Y20 fare and takes 1 hour 45 mins — Summer 2006.). 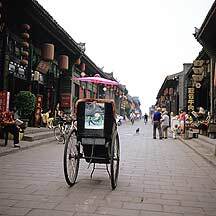 Pingyao is located south of Taiyuan, so buses going there are in the south bus station. Jiannan bus station is a big open square behind the ticket building; all the buses wait there, and each bus has a sign with its destination written on it. I came to Taiyuan from 榆林Yulin where the bus left at 7:30 in the morning; from then, the bus made the epic ride through the 黄土Huangtu (loess) landscape, passing villages, towns and cities, til finally we arrived at the very big city of Taiyuan, whose long, long avenues shot straight to the horizon. It was then 7:15 in the evening. For the next half hour I wandered around the neighborhood thinking about what I should do next: should I stay in the city for the night or go to one of the places down south? The Yulin bus had dropped me off near the north bus station where the railway station is located as well. None of my destinations were listed on the bus station. But after a minute with the ticket clerk I was told to go to the south bus station. After some hesitation I finally headed down to the South Station to check for luck. It was late and the ticket windows were closed, so I went out to the parking space to see what was left. As always there were the minivans to take me to anywhere. But be careful of these services: they normally charge alot; but worse is that they might drop you off at inconvenient places, which can be very stressful at night. I checked every bus parked there, and to my good luck the last bus to Pingyao was waiting for me. Originally, I had planned to travel southward from Taiyuan, jumping from the nearest destination to the next — from 榆次Yuci to 太谷Taigu to 祁县Qixian to 平遥Pingyao. From Pingyao, I moved further south to 灵石Lingshi. After that I moved up one town after another toward Taiyuan. I was quite satified, and since there was still some time I went to the corner to get a bag of boiled eggs for the missed lunch and dinner. At 8' 0 clock, the bus headed out. You can also get to Pingyao by rail from Taiyuan city. 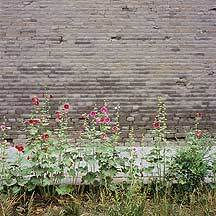 Once in Pingyao, which is not a very big county, you can walk to the city wall. The walk from the railway station to the wall is about 15 mins. Pingyao is a UNESCO site. So it is well-known internationally. As that there are all sorts of accomodations to fit your needs. 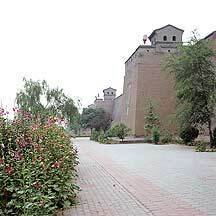 Outside the walled town, there are plenty of hotels. Y150 will get you a good room with a private bathroom. 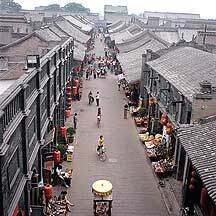 Inside the walled town, there are also lots of guesthouses. These large guesthouses are normally 2-stories buildings designed like the classical architecture in the area. Y50 will get you a good room, maybe with a private bathroom. Entrance to the walled town is free. To see the important buildings or climb the city wall you will need a ticket. A Y120 ticket will open doors to about 20 or so historic sites in the town. Y5 to get up the 市楼Shilou (the City Tower), which is on the 南大街South Avenue. Summer 2006.